Metro blog experiencing technical difficulties at the moment. Early diagnosis of the problem: it's Nov. 7. Programming note: Beginning at 8 p.m. Tuesday night, I’ll start an open thread post with election results updates on Measure M, social media reaction and other transit results from around the U.S. Also, Metro CEO Phil Washington has sent a memo to Metro staff about the agency and the election. A little pre-election music because true patriots always vote! Department of Self-Driving Cars: I have my doubts. Department of Go Metro to an NFL playoff game: not this season unless the Rams can rise above the 13th seed and do it somewhat quickly. Department of Canada: Let freedom ring, Canucks and Maple Leafs. Things to watch whilst transiting. Things to listen to whilst transiting: Great Fresh Air on Twitter’s reluctance to stop abusive behavior by its user. Snapped this while walking the other day in DTLA. Yeah, it’s modernizing but still so many old buildings! Photo by Steve Hymon. A good story that looks at the project that received seed funding from Measure R and would receive much, much more funding from the Measure M sales tax ballot measure that is part of tomorrow’s election. As the story notes, the tunnels are scheduled to open in the 2033-36 timeframe but Metro is whether a public-private partnership could be used to accelerate this project and others. See this news release for more info. Measure M would raise the countywide sales tax by a half cent and extend the Measure R sales tax by a half cent beyond its end date in 2039 to fund a number of transit, road, pedestrian and bicycle projects and programs. Please click here to learn more and click here and scroll down to see a timeline of projects and programs. As the episode description says, the ballot measure could fund the next generation of Metro transit projects but not everyone in the county is convinced they’ll see the funds. In this opinion piece, architect Thom Mayne asks a good question: how does L.A. County add 1.5 million people in the coming decades and take on the challenges of climate change at the same time? 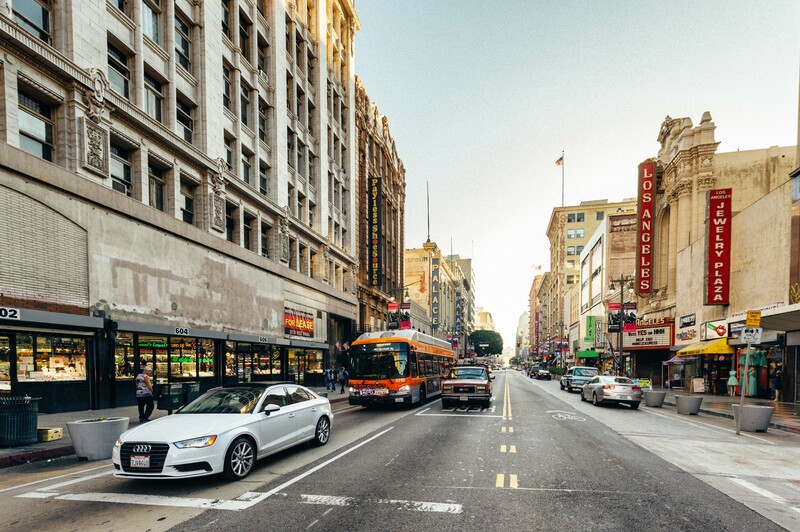 Wilshire Boulevard could easily accommodate another million residents. In fact, using Hong Kong’s residential building types, it could accommodate another 8 million people. In our relatively conservative model, the density of the Wilshire corridor would be less than that of Manhattan. The densest neighborhood in the corridor would be Koreatown, which, even after more than doubling its population, would still be less dense than Manhattan’s Upper East Side. Our proposal would extend the Purple Line light rail to Santa Monica, allowing more than a million residents to live within a half mile of a Metro stop. Interesting to hear someone talking about extending the Purple Line beyond Westwood. For all the talk of the “subway to the sea” in the 2005 mayoral campaign in Los Angeles, this idea doesn’t seem to get discussed much anymore and it lacks funding. I’ve had some people tell me that it doesn’t make sense since it would put the subway and the Expo Line within a mile of one another in Santa Monica, with each line stealing riders from the other. I’ve always thought that was a kind of dumb argument, remembering my time in New York when it was quite convenient to live on 15th Street between the 7th Avenue and 8th Avenue subway lines — so convenient! Read the rest of Thom Mayne’s piece. He makes some persuasive arguments for densification and argues how it can be done. He knows as well as anyone that density has often been a word that results in the gloves being dropped in L.A. — although some of that has been because there wasn’t a fully formed transit system to help mitigate the “traffic will kill us” argument. ICYMI: The first segment of the Purple Line Extension from Wilshire/Western to Wilshire/La Cienega is under construction and scheduled for completion in late 2023. The second phase would extend the subway to downtown Beverly Hills and Century City while the third phase would take the subway to two stations in Westwood. Measure M includes funding to accelerate the third phase to a 2024-26 time frame from its current mid-2030s opening date. From a HWR perspective, the 105-110 interchange, Angels Flight and the Colorado Avenue bridge all have supporting roles in the film. Plus Emma Stone and Ryan Gosling. An unexpected delay arrived a few months later, when contaminated soil was found on the site. Additionally, crews discovered roller skates, pieces of clothing and other items from the late 1800s. Among the finds were medicine bottles to treat gonorrhea, along with women’s stockings, prompting speculation that the park site might once have housed a brothel. The soil was cleaned and work was able to resume. That led to the current project, which is laid out with an emphasis on circles — the paved areas make three arcs across the space, while grass and tree-covered portions are also set up in rings. As for “how much capacity does it add?” the answer is– not surprisingly– “it depends”. It depends on the speed of traffic (Wilshire can add not many cars at all, but the 405 gets a decent boost), it depends on what percentage of the fleet gets converted, and it depends whether theoretical technology (cars communicating with each other) gets added to the currently developed technology. The hypothetical capacity improvement starts to really kick in when 80% of the cars on the road get converted to technology that does not yet exist. I’d be curious if anyone on your side could check my math. But when I squint at the charts, I see this: The 405 currently has a capacity of about 2,400 passenger cars per lane per hour (if not stopped). If you were to replace about half the cars with self-driving cars, you could squeeze an extra thousand cars per lane per hour. By contrast, a four-car light rail train under the 405, built today with entirely off-the-shelf technology, can move about 25,000 passengers per hour in each direction at peak load. Thanks for your thoughts. I know peak capacity on freeways is determined by formulas such as this: https://www.fhwa.dot.gov/ohim/hpmsmanl/appn1.cfm. I’ve seen different numbers for freeways with traffic getting substantially worse at 2K vehicles per hour per lane. I have little doubt that you can probably squeeze more capacity from that with better driving behavior — either from humans or computers — but I wonder how much we can really pull off and whether it will be substantially faster than current speeds and drive times. The Sepulveda project hasn’t gone through the environmental studies yet and I’m reluctant to predict how often trains will run or how long they will be (Metro’s light rail system stations can’t accommodate trains longer than three cars at this time). But a three-car train if at full capacity can probably carry 500 people. So you can do the math there. I don’t think a rail project should be viewed as a traffic eraser, but rather a good traffic alternative. It is probably fair to say that in the case of the 405, a good high-capacity Sepulveda transit project and perhaps self-driving cars may result in slightly better traffic flow. The X factor, of course, is growth. If self-driving cars increase capacity by 25 percent (a generous number in my view), will that be erased by a 25 percent increase in the number of cars from population growth? Damn future: hard to predict!! !